Three granted patents, one published and one recently filed. Abstract: An electric motor controller is disclosed that controls the torque of a switched reluctance motor by an angle controller that eliminates the need for a look-up table. The angle controller employs edge-triggered monostables to generate a single pulse firing signal which is synchronized with rotor position and whose pulse length varies with torque demand. An angle firing circuit utilizing freewheeling is also disclosed. Patent Family: AU50450/96A, AU707632B2, BRPI9601262A, CA2173419A1, CN1144418A, CN1063298C, DE69606574D1, DE69606574T2, EP0736962A2, EP0736962A3, EP0736962B1, JPH8-317680A, JP3668319B2, KR1996-0039579A, KR10-0400516B1, MXP9601241A, SG38957A1, TW288229B, US5789893A, ZA9602766A. Abstract: A method of monitoring rotor position in a reluctance machine comprises determining the rate of change of current at a particular point at which current in the winding is arranged to freewheel. Preferably the point coincides with alignment of a rotor and a stator pole such that the rate of change of current is predicted to be zero. The magnitude and polarity of any variation from the predicted rate of change indicates a rotor position removed from the actual rotor position and whether it is in advance of, or retreated from, the predicted position. Patent Family: DE69607122D1, DE69607122T2, EP0780966A2, EP0780966A3, EP0780966B1, MX9606557A, SG50778A1, US5793179A. Abstract: A system (100) for connecting a fuel cell stack to an A.C. grid to provide power thereto is disclosed in which a voltage regulated D. C. bus (110) is provided to be coupled to the fuel cell stack, a bidirectional inverter (120) is coupled to the D. C. bus (110), and is to be coupled between the D. C. bus (110) and the A.C. grid. At least one D. C. auxiliary load (130) of the fuel cell stack is provided coupled to the D.C. bus (110). A D.C. to D. C. converter (140) is provided between the fuel cell stack and the D.C. bus (110). Patent Family: AU2007280258A1, AU2007280258, BRPI0715350-3A2, CA2660033A1, CA2660033C, CN101501977A, CN101501977B, DE602007033050D1, DK2047590T3, EA200970181A1, EA016526B1, EP2047590A1, EP2047590B1, ES2448581T3, GB2441849A, GB2441849B, HK1127168A1, JP2009-545944A, JP5563819B2, KR10-2009-0042284A, KR10-1490356B1, MX2009001330A, MY147611A, US2008/0067869A1, US7880334B2, WO2008/015461A1. Abstract: A method to control the rotor position in a reluctance machine is disclosed. The method involves energising the phase winding so to move the rotor relative to the stator, freewheeling current through the phase winding over a freewheeling period, sampling rate of change of phase current and amplitude of phase current, de-energising the phase winding and computing the angular position of the rotor. 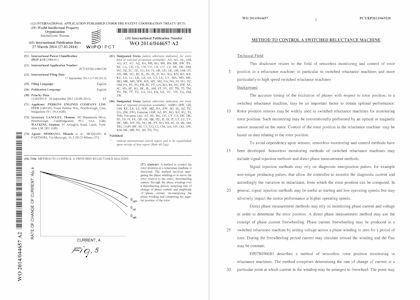 Patent Family: CN104641548A, EP2712075A1, US2015/0249408A1, WO2014/044657A2, WO2014/044657A3. Copyright © 1998 - 2016 by Fleadh Electronics Ltd, Leeds, UK. All rights reserved. 45, Arlington Road, Leeds, LS8 2RU, UK.